Land, body, and memory all inform one another. The land, extending out and into the ocean, holds the practical and epistemological memories of encounters. The body is the agent, the participant in the environment, and the container of memories. For Hawaiians in the past, vital information was relayed through the environment, and this memory of ka ʻāina (the land; that which feeds) affected close interpersonal relationships and societal structures. Vestiges of that connection to kaʻāina still exist in places and still hold valuable information about who we are. The dynamics and evolution of land, body, and memory can be glimpsed in the land tenure documents and in the personal stories that accompanied the exchanges of private property. I search and wonder at the connections, then and now, of land and ocean, body, and memory. I found the following narrative about the Lele of Hamohamo at the Hawaiʻi State Archives eight years ago. I was there researching my last name, and when I found this handwritten chapter by my great-great-grandfather, Curtis Piehu Iaukea, I had only a glimmer of a clue as to what he was talking about. I had only just recently found the map to this property at the Bureau of Conveyances in Honolulu, but had not yet uncovered the Kalanianaʻole suit he refers to from the Circuit Court (Oʻahu First Circuit). This narrative and others like it helped me piece together and gain insight into the larger story of the political transfer of land in general from Hawaiian Kingdom sovereign territory to the Territory of Hawaiʻi, the story of Curtis Piehu Iaukea, and finally my own personal narrative. The three stories collide but intimately inform one another, and they do so because of my great-great-grandfather's recorded memory of land-how it was transferred, who transferred it, and what the continuing consequences of these transactions are a century later. Memory fills in the moʻo kūʻauhau (genealogy) in practical and more fundamental ways. The Lele of Hamohamo starts and ends this book because it is a microcosm of how I have come to understand myself, my kūpuna (ancestors), and my community. "I find I have devised to Mr. C.P. Iaukea a certain lot in Hamohamo, to his heirs and assigns forever. It was not my intention that he should have the benefit of it forever, and as you know I have devised my other beneficiaries their portions for their life and their heirs, failing which the property should revert back to my trustees. It is now my purpose to revoke that and revert the property back to the trust." Having all the earmarks of one whom I had good reason to believe had written the letter, whose name I'd rather not mention, I had no hesitation in saying so, when asked by my colleagues on the board of trustees what I thought of the Queen's proposition. Convinced as I was that it was not the Queen's wish, I said to them that if they wanted to consent to the request by an amendment to the deed of trust, they could do so, but that I would not be a party to it. It would be a sign of weakness, I said, and might affect our side of the case when the Kalanianaole suit comes up for trial, as showing that the Queen was mentally unsound at the time she signed the deed of trust. I further called Mr. Smith and Mr. Damon's attention to the fact that, on the two occasions when the draft of the trust deed and the deed itself were read to the Queen, the difference in tenure between the other beneficiaries and mine was referred to; the Queen distinctly saying in the presence of those who were then there with her at the time, myself included, "I wish it so; Mr. Iaukea has done a great deal for me." What I said impressed them. I heard nothing further in the matter until a day or two later when Mr. Smith reported that, he had interviewed the Queen on two separate occasions; when the Queen said to him, "We will consider it further; put it off." And on the next visit, "Oh, let that go, We won't follow that any further." Mr. Smith leaving her with the impression that she wished nothing further done about the matter. Closing another chapter of the many intricacies and machinations that surround court life which I have experienced in the course of a lifetime, Liliuokalani's being no exception to the rule. Speaking of the tract of land in question, Queen Liliuokalani devised to me, known as the "Lele of Hamohamo," situate at Waikiki waena, a quarter of a mile away from the main tract known as the "Ili of Hamohamo," it contained some seven acres, a little more or less. Rice land, and under lease at $200 a year rental. I did not come into possession of the land until eight years had passed with the Queen's death in September of 1917 and when I did it was encumbered by a lease to a Mr. H.A. Heen for some years to run at the same rental of $200 per annum, the prevailing rental for rice lands in those days, of between $25.00 and $30.00 per acre. So that, it wasn't the magnificent gift as many have erroneously claimed, when the services I had rendered the grantor is taken into consideration. It wasn't very long after I had obtained the fee to the land under the provisions of the trust deed, when I turned the whole tract over to my wife, who owned in her own right some fifteen acres adjoining the "Lele of Hamohamo" on the Diamond Head side and next (to) the fair Grounds. In this exposé Sydney L. Iaukea ties personal memories to newly procured political information about Hawai`i’s crucial Territorial era. Spurred by questions surrounding intergenerational property disputes in her immediate family, she delves into Hawai`i’s historical archives. There she discovers the central role played by her great-great-grandfather in the politics of late-nineteenth- and early-twentieth-century Hawai`i—in particular, Curtis P. Iaukea’s trusted position with the Hawaiian Kingdom’s last ruling monarch, Queen Lili`uokalani. As Iaukea charts her ancestor’s efforts to defend a culture under siege, she reveals astonishing legal and legislative maneuvers that show us how capitalism reshaped cultural relationships. She finds resonant parallels and connections between her own upbringing in Maui’s housing projects, her family’s penchant for hiding property, and the Hawaiian peoples’ loss of their country and lands. Sydney L. Iaukea holds a Ph.D. in political science with a specialty in Hawai?i politics. She is a dedicated community member, instructor, and avid surfer. 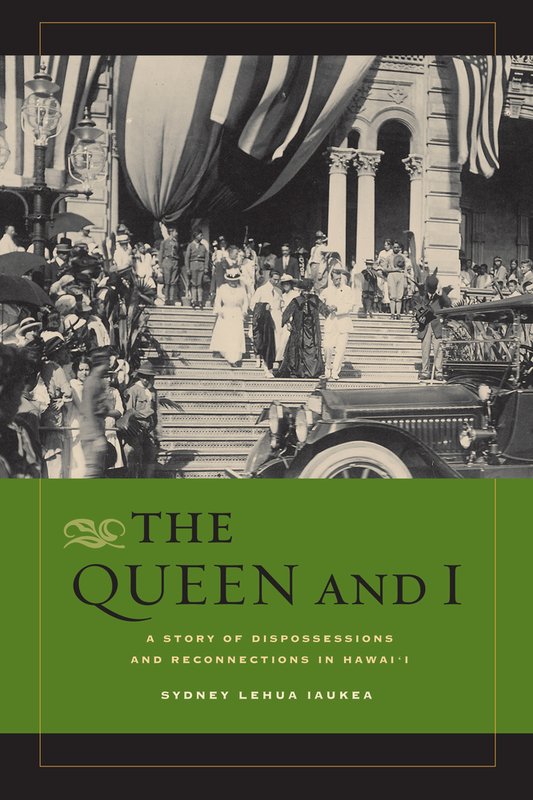 "The Queen and I will be a very important contribution to historical and political literature on early twentieth century Hawai'i. But through its intensely personal narrative, it could have an even greater impact on the way people look at history. Sydney Iaukea weaves archival information into a story about a well-known historical figure while demonstrating the impact of these archival voices on herself. In this way she binds herself to her ancestor and allows him to speak through her, showing how an ancient value can be a new methodology for Native writers in indigenous studies."